Stony Grey Stafford, 71, from West Park, FL, passed away peacefully on January 23rd, 2019. He was under the care of Hope Hospice, in Cape Coral, FL, and attended to by his loving family. Stony was born August 26th, 1947, in High Point, North Carolina. He was preceded in death by his parents, James and Mamie Stafford; sister Debbie; brothers Butch, Johnny and Sonny. He is survived by his wife Donna; daughter Cristal; sons Lee and Daniel; daughter-in-laws Lauren and Angie; son-in-law Mathias; grandchildren Seth, Kallen, Dane, Connor, Sanibella, Calla and Benny Grey; sister-in-law Bessie; niece Wendy; nephews Kelly and Kevin; great nieces Mandy and Micheala. Stony was an auto mechanic by trade and started his career at Cadillac. Stony even owned his own auto mechanic business, Stony’s Auto Air, for over 25 years. He spent his entire adult life working as an auto mechanic. He retired at the very young age of 55. Stony enjoyed fixing everything from cars, planes and homes to baby strollers. Stony’s true passion was flying. He received his pilot’s license at the young age of 18. He was an avid aviator. Stony spent over 53 years enjoying this passion. He enjoyed going to the airport and hanging out, lending a helping hand to a fellow pilot, attending airshows, and making hundreds of flights. 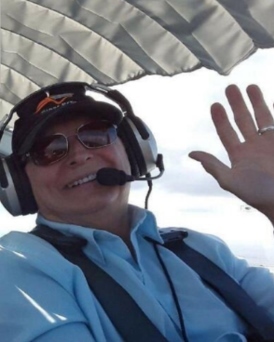 Most of all he enjoyed daytrips with his flying partner and friend, Rick, who was with him on his very last flight. Stony was a Husband, Father, Papa, Brother, Uncle, Pilot and Friend to all. Stony’s favorite title was Papa. His 7 grandchildren were the light in his life. He always had a picture or story to share about them. His helping hand and magical smile will be greatly missed by all who had the privilege of loving and knowing him. The family suggests any donations be made to Hope Hospice at HopeHCS.org. Funeral arrangements are being handled by Fred Hunter’s, in Hollywood, FL. Condolences may be shared with the family at fullermetz.com. A service of remembrance will be held at Fred Hunter’s, in Hollywood, FL, on Saturday, February 9th at 3:00pm. Located at 6301 Taft Street, Hollywood, FL, 33024, 954-989-1550.